My card features one of the Paper Sweetie Dolls-Abigail. I paper pieced Abigail's outfit and then did a little shading with some Copic Markers. Her outfit is from the Paper Sweeties Boutique and is called Sweetie Pie. That big gorgeous heart is from the new With Love Sweet Cuts! 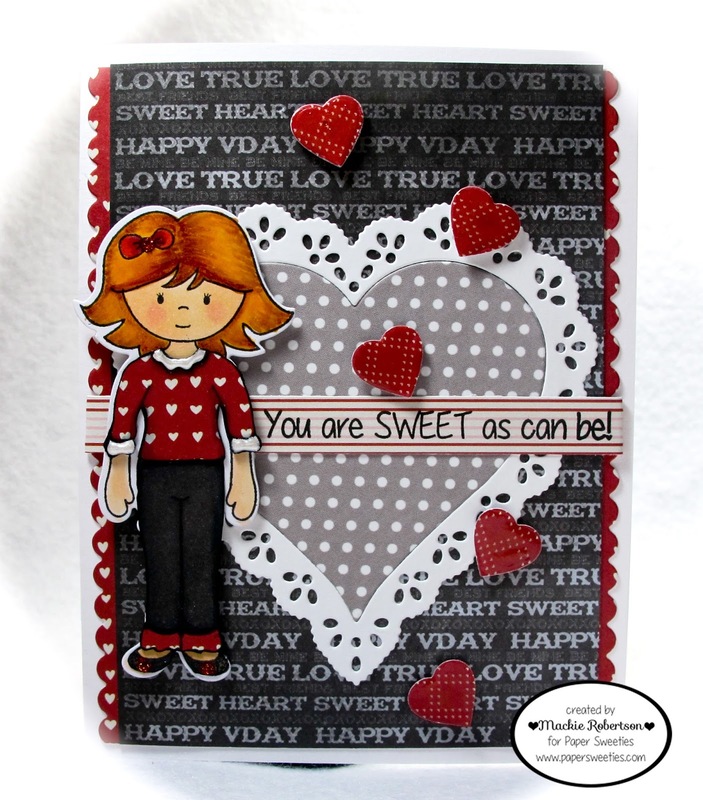 And the sentiment is from the new Sweet Treats stamp set! to see more creations featuring the new with the old! Awwwww...totally adorable Valentine! Awesome papers too! How cute is this!! You did a great job on her hair Mackie, this is darling! Abigail is darling as can be, Mackie! Love the red/black/white combo for your sweet Valentine card! Gorgeous! Love the b/w and red! And are those ruby slippers on our Abby??? Too, too cute! Such a cute card Mackie! You did a great job coloring the sweet image! Love the fancy heart doily! Love her sweater and the cuffs on her jeans! Darling, Mackie! So cute!! I love Abigail's paper pieced outfit!! !